“French President Emmanuel Macron has announced new measures to tackle anti-Semitism, following a spate of attacks. As was noted here at the time, that article promoted the Livingstone Formulation, failed to inform readers what anti-Zionism actually means and focused on promoting the inaccurate and misleading notion that anti-Zionism is the same thing as expressing criticism of the policies and actions of the Israeli government, even while advancing the ‘Zionism is racism’ canard. “The UK Labour Party has been at the centre of a row over anti-Semitism, including its relationship to anti-Zionism. What do these terms actually mean? Anti-Semitism is “hostility and prejudice directed against Jewish people” (OED). Zionism refers to the movement to create a Jewish state in the Middle East, corresponding to the historic land of Israel – anti-Zionism opposes that. Since publishing that unsatisfactory and unhelpful backgrounder, the BBC has continued to amplify those themes. Given the BBC’s record on reporting the issue of anti-Zionism, its audiences obviously lack the background knowledge necessary for proper understanding of the French president’s statement reported in this article. That state of affairs will continue as long as the BBC continues to ignore the existence of accepted definitions of antisemitism which long since answered the question of whether anti-Zionism – i.e. the denial of the right of the Jewish people to self-determination – is an expression of antisemitism. That ‘Newsnight’ report included an interview with a man introduced by Paxman as “the French writer and film-maker Alain Soral” and “a close friend of Monsieur Dieudonné” who “helped him popularise the infamous quenelle gesture”. BBC audiences were told nothing of Soral’s far-Right affiliations and record of antisemitism before they heard him whitewashing the antisemitism of his “close friend” by means of antisemitic conspiracy theories. Last week the man the BBC found it appropriate to interview on the subject of antisemitism was sentenced to a year in prison. “A French court on Thursday sentenced far-right Holocaust denier Alain Soral to one year in prison for insulting a magistrate and making anti-Semitic comments on his website. While this latest conviction will come as no surprise to those familiar with Soral, five years on it is still unclear how BBC editors could have been so uninformed as to consider the airing of his antisemitic conspiracy theories and whitewashing of the racism of his “close friend” to be any kind of contribution to audience understanding of antisemitism. BBC News website coverage of the March 23rd terror attack in south-west France included two reports – “France hostage crisis: ‘Two dead’ in Trèbes supermarket” and “France shooting: Police kill supermarket gunman” – featuring an insert titled “Major terror attacks in France”. Obviously the BBC’s description of those attacks as acts of terror is appropriate – notwithstanding the corporation’s supposed editorial policy of avoiding the word ‘terrorist’ without attribution in order to avoid “value judgements”. However, as regular readers will be aware, while its reports on attacks in certain locations (especially Europe and North America) do use such terminology, the BBC consistently refuses to use the word terror in its reporting on comparable attacks against Israelis and audiences have never been provided with an insert titled “Major terror attacks in Israel”. “Where there is an ongoing geopolitical conflict – as in the Middle East – to use the term “terror attack” or similar might be seen to be taking sides. There are those who might consider the actions of the Israeli government to be considered as terrorist acts. In a situation where a country that is not involved in a direct physical combat comes under attack, it may be reasonable to construe that as a terrorist incident. France is of course part of the coalition involved in military action against ISIS in Iraq and Syria but once again the BBC apparently does not consider that to be “direct physical combat” and is not inclined to promote the notion that France’s actions against jihadist terrorism might be “considered as terrorist acts”. Sadly, that contorted excuse for the double standards seen in the language used in BBC coverage of terrorism in different locations was given the OFCOM rubber stamp later last year. As has been noted here on numerous occasions the double standard evident in the BBC’s use of terminology is rooted in the fact that it chooses to conflate means with ends, claiming that if a person commits an act of violence against civilians with the purpose of furthering a political or religious agenda in a country in which there is “an ongoing geopolitical conflict”, that is not terrorism but if he does the exact same in a country where there is no such ongoing conflict, it does fit that description. And so, while the BBC regularly uses appropriate language in its coverage of terror attacks in France (and elsewhere), its reporting on attacks against Israelis does not employ the same terminology. “A French national employed at the country’s consulate in Jerusalem will appear in court on Monday charged with smuggling weapons to the Gaza Strip. Israel’s Shin Bet security agency said the unnamed man, in his 20s, was arrested in February while crossing into Gaza from Israel. One of the suspect’s jobs at the consulate was as a driver, involving regular trips to Gaza, reports say. Israel has long tried to prevent arms reaching Gaza’s militant Hamas group. Shin Bet said the suspect had smuggled more than 70 pistols and two assault rifles into Gaza over a period of five trips. It said he used a consulate vehicle to elude detection. Hamas has fought three conflicts with Israel and carried out thousands of rocket [sic] and bombings against it. In fact, that story is about an employee of the French consulate in Jerusalem (who, despite the BBC’s claim, was named) allegedly smuggling weapons from the Gaza Strip to Judea & Samaria. “Two French embassy workers have been arrested by Israel’s Shin Bet internal security agency on suspicion of smuggling dozens of weapons from the Hamas-run Gaza Strip to the West Bank, the agency cleared for release on Monday. According to the Shin Bet investigation, Frank received the weapons from a Palestinian resident of the Gaza Strip employed at the French Cultural Center in the Gaza Strip and he transferred the weapons to a cell in the West Bank who sold them to arms dealers. “A French national employed at the country’s consulate in Jerusalem will appear in court on Monday charged with smuggling weapons from the Gaza Strip. Israel’s Shin Bet security agency said the unnamed man, in his 20s, was arrested in February at the Erez border crossing. Israel has long tried to prevent arms reaching Palestinian militants. Shin Bet said the suspect had smuggled more than 70 pistols and two assault rifles from Gaza into the West Bank over a period of five trips. It said he used a consulate vehicle to elude detection. At the July 16th event in Paris marking the 75th anniversary of the deportation of French Jews to Auschwitz, the French president made a significant statement. “French president Emmanuel Macron on Sunday condemned anti-Zionism as a new form of anti-Semitism, in what observers said was an unprecedented statement from the leader of France in support of the Jewish state. Macron’s statement is of course in step with the IHRA working definition of antisemitism that was adopted in recent months by the British government and the EU parliament as well as in accord with the US State department’s definition. His words were reported by numerous media outlets including the Independent, the Times, the Washington Post and the New York Times. However, the BBC News website’s report on the ceremony made no mention whatsoever of the French president’s recognition of anti-Zionism as a manifestation of antisemitism. Should we be surprised at the omission of that statement from the BBC’s coverage of the event? Not really. Last April – despite the fact that it still does not work according to an accepted definition of antisemitism – the BBC considered itself sufficiently qualified to produce a backgrounder titled “What’s the difference between anti-Semitism and anti-Zionism?“. As was noted here at the time, that article promoted the Livingstone Formulation, failed to inform readers what anti-Zionism actually means and focused on promoting the inaccurate and misleading notion that anti-Zionism is the same thing as expressing criticism of the policies and actions of the Israeli government while advancing the ‘Zionism is racism’ canard. 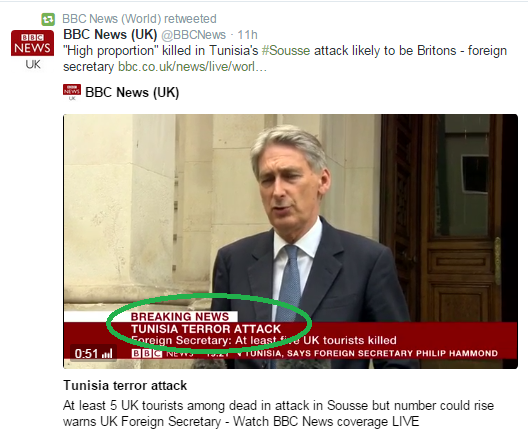 Subsequent BBC reporting again amplified similar themes. The BBC’s funding public should therefore not be overly surprised that a statement from the French president that contrasts starkly with the BBC’s repeated woolly misrepresentations of anti-Zionism and spotlights the corporation’s calculated disregard for accepted definitions of antisemitism was sidelined by BBC News. IHRA adopts working definition of antisemitism: when will the BBC? On July 16th an article titled “Netanyahu in Paris to commemorate Vel d’Hiv deportation of Jews” appeared on the BBC News website’s Europe and Middle East pages. However, the version of that report which is currently available is markedly different from its earlier editions. “Israeli Prime Minister Benjamin Netanyahu is in Paris to commemorate the victims of a mass arrest of Jews in Nazi-occupied France in 1942. More than 13,000 Jews were rounded up and detained at a cycling stadium, the Velodrome d’Hiver, before being deported to Nazi death camps. Mr Netanyahu will also hold direct talks for the first time with French President Emmanuel Macron. “The visit has drawn consternation from critics of the Israeli PM. “Elie Barnav, a former French ambassador to Israel, told AFP news agency: “The presence of Netanyahu makes me a little uneasy. Obviously the BBC did not copy/paste the AFP report it recycled properly because the person concerned is actually called Elie Barnavi rather than ‘Barnav’. Clearly too, the BBC did not bother to check the original AFP article in French because had it done so, it would know that Mr Barnavi is in fact “l’ancien ambassadeur d’Israël en France” – the former Israeli ambassador to France – (2000 to 2002) rather than “a former French ambassador to Israel” as was inaccurately claimed in the English language version of that AFP report. It would therefore have been appropriate for readers to have been informed of Mr Barnavi’s links to political groups of a particular stripe – which are far more relevant in the context of his comments than his time spent in the diplomatic service. Similarly, when the BBC decided to promote the view of a tiny fringe French group also quoted in the AFP article (including a link to its website) it should have clarified to readers that UJFP supports the anti-Israel BDS campaign. BBC Watch contacted the BBC News website raising those issues and subsequently the article was amended yet again to correct the inaccurate reporting of Mr Barnavi’s name and former position. The tepid and unhelpful description “a pro-Palestinian organisation” was added to the sentence promoting the UJFP. No footnote was added to advise BBC audiences who had read the earlier versions of the report of the inaccuracies in its first three editions. Obviously the BBC was far more concerned with amplifying politically motivated criticism of the Israeli prime minister’s Paris visit (at the invitation of the French president: a point strangely absent from the BBC’s account of the story) than it was in ensuring that audiences were provided with accurate and impartial information. Eventually – some six and a half hours after its original appearance – the article was amended once again and the sections amplifying politically motivated criticism of the Israeli PM’s participation in the ceremony that was its subject matter were completely removed. Further examples of the double standard evident in the BBC’s use of the term terrorism were recently supplied by a series of programmes broadcast on BBC Radio 4. On August 29th the station’s consumer affairs programme ‘You & Yours’ – presented by Winifred Robinson – broadcast an edition titled “Terrorism vs Tourism” which discussed the impact of terrorism “on people flying to Mediterranean resorts”. “Terrorists are increasingly targeting tourist resorts and destination cities. In today’s You & Yours we report on the human impact of terror attacks and the long-term affect [sic] on the countries they target. Unsurprisingly, Israel – which has both past and recent experience of dealing with the effects of terrorism on its tourist industry – was not included among those “Mediterranean resorts”. The following day – August 30th – another programme on the same topic was aired under the title “Call You and Yours: how has terrorism at home or abroad affected your holiday plans?“. “Terrorism is at the top of the agenda at the moment, after high profile attacks in Paris, Nice and Tunisia. We’d like to know if it’s made a difference to how you live your life. Perhaps you’ve changed your destination – or had second thoughts about taking your family abroad. The September 5th edition of ‘You & Yours’ included an item on “Egypt tourism“. Throughout all three of those programmes, the term terror was used frequently and appropriately. Obviously the programme makers did not feel uncomfortable making the kind of “value judgements” which the BBC editorial guidelines on language when reporting terrorism instruct them to avoid. Last month we noted here that the BBC had found a ‘working definition’ of terrorism with which it is apparently comfortable – at least when reporting on incidents in Europe. Once again this series of Radio 4 programmes demonstrates all too clearly that those editorial guidelines are not being applied in a uniform and consistent manner. 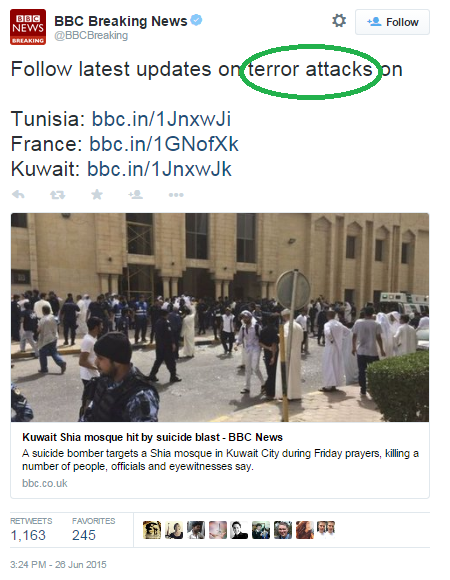 When the BBC wants to use words such as ‘terror’, ‘terrorism’ or ‘terrorist’, it does. When it wants to make “value judgements”, it does and in fact what dictates the BBC’s choice of terminology is “a political position” of precisely the type it claims to try to avoid. Absurdly, while evidence to the contrary accumulates, the corporation continues to claim that its coverage of terrorism is consistent, accurate and impartial. Last October we discussed an article by Kevin Connolly – then of the BBC’s Jerusalem bureau – which has since been promoted as ‘related reading’ many times on the BBC News website. “During the first three weeks of October 2015, ten Israelis were killed and 112 wounded – eleven of them seriously – in forty stabbing attacks, four shootings and five vehicular attacks which took place throughout the country. On October 23rd, however, BBC News told its audiences that Israelis are suffering from either a collective psychosis ‘characterised by delusions of persecution’ or ‘unjustified suspicion and mistrust of other people’ – depending on which definition of the word paranoia BBC editors intended their headline to communicate. Happily, such a scenario has not transpired in Britain but at the end of July, the BBC World Service turned its attentions to “the fear that lies over Europe” in an edition of ‘The World This Week’. “Europe has not known a week or two like the last ones for many, many years. First the terrible slaughter in Nice that left at least 84 dead, then a string of attacks in southern Germany. Then this week the killing of a French priest in a quiet town as he and his parishioners celebrated morning mass on a summer’s day. So as we see, in contrast to its portrayal of Israeli fears of what it refuses to term terrorism as ‘paranoia’, the BBC is perfectly able to identify – and empathise with – the understandable fears of Europeans following what it has no problem defining as “terror attacks”. And remarkably, it also has no qualms about identifying the cause: “violent Islam”. The item went on to include reference to an issue rarely if ever acknowledged in BBC coverage of Israel: the obligation of a state to defend its citizens. Asked by Dymond if the terror attacks “lead to a more introspective Europe”, Wilson remarked that “Europe’s leaders are consumed with the internal problems […] they are absolutely absorbed with these crises” and noted that European Council president Donald Tusk “has said publicly he thinks Western civilisation is being threatened by everything that’s going on”. As readers no doubt recall the BBC long since made it clear that it believes that terror attacks against Israelis are “very different” from – and not comparable to – those perpetrated against citizens of other nations. Apparently it is also of the opinion that the concerns of Israeli civilians can be portrayed differently from those of citizens of EU countries. While the BBC refuses to acknowledge that the double standard it promotes is a “significant issue of general importance”, we remain convinced that it compromises the BBC’s claim to impartial reporting. After a shaky start, BBC News was soon able to provide its audiences with an accurate description of the horrendous attack on Bastille Day revellers in Nice on the evening of July 14th. Terror attacks using vehicles have not been afforded the same clarity of description by the BBC when perpetrated against Israelis. In August 2014 BBC News reported a “Suspected ‘attack’ on bus with digger in Jerusalem”. On October 22nd 2014 a vehicular attack in Jerusalem in which two people were murdered was described as a “car ‘attack'”. BBC reports on vehicular attack in Jerusalem on November 5th 2014 in which two people were murdered were headlined “Driver hits pedestrians in East Jerusalem” and a follow-up report described a “van attack”. A fatal vehicular attack in Jerusalem on April 15th 2015 did not receive any coverage from the BBC and neither did a fatal vehicular attack at Halhoul Junction on November 4th of that year. Numerous additional attacks have either been ignored or reported without use of the word terror. In one case, not only did the BBC not tell audiences that a terror attack had taken place but even amplified anonymous hearsay suggesting it had not. 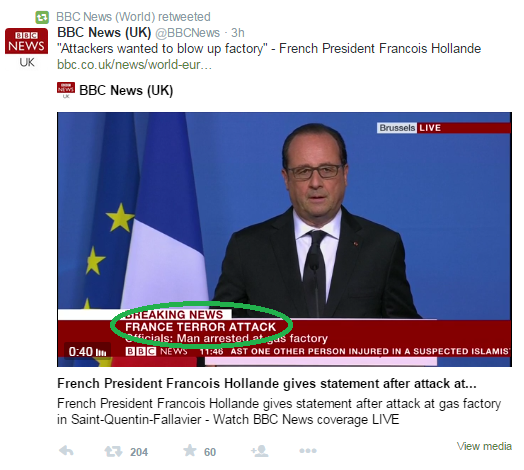 Once again the BBC’s double standards when reporting terrorism are all too apparent. “Our policy is about achieving consistency and accuracy in our journalism. We recognise the existence and the reality of terrorism – at this point in the twenty first century we could hardly do otherwise. Moreover, we don’t change the word “terrorist” when quoting other people, but we try to avoid the word ourselves; not because we are morally neutral towards terrorism, nor because we have any sympathy for the perpetrators of the inhuman atrocities which all too often we have to report, but because terrorism is a difficult and emotive subject with significant political overtones. However, as has frequently been noted on these pages the BBC’s reporting on terrorism is in fact anything but consistent and the corporation’s reporting on the wave of terror attacks which took place in three countries on June 26th provided another example of that phenomenon. When two terrorists armed with a gun, knives and axes walked into a Jerusalem synagogue in November 2014 and slaughtered early morning worshippers, the BBC did not categorise that incident as a terror attack. 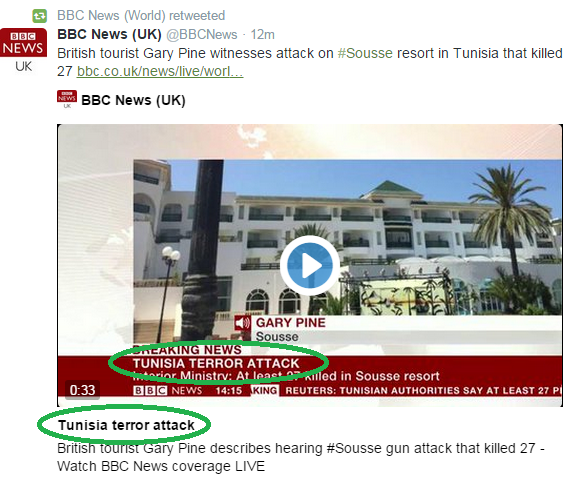 When at least one terrorist armed with a rifle walked onto a beach in Tunisia in June 2015 and gunned down equally unsuspecting tourists, the language used by the BBC in some of its coverage was very clear. 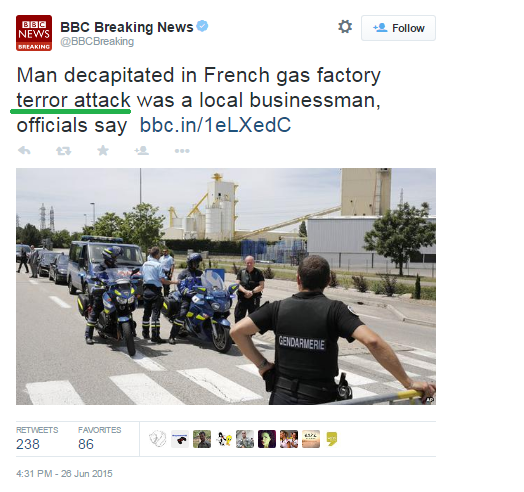 Coverage of the other attacks which took place on the same day in France and Kuwait also employed the word terror. One can only imagine what the public and parliamentary reaction would have been if – as it did following the January terror attacks in Paris – the BBC had promoted the view that the word terrorist was too “loaded” for use in coverage of the murder of British holiday makers in Tunisia. But the fact that in this case appropriate use of the word terror was seen in some of the BBC’s coverage of these attacks only serves to further highlight the inconsistency of its practice and the absence of universality in its professed avoidance of making “value judgements”.